Don't fear the chia seed. Use it for what it's best at: Making nutrient-rich, delicious puddings, like this one that's perfect for any time of day! Are you an on-the-go, or desk breakfast eater? We have the perfect meal! This vanilla spice chia pudding is full of good nutrition that will keep you feeling full and energized all day. Made with N+B's Whole Food Shake, it's full of protein, fiber, and other good-for-you vitamins and minerals. The best part about this pudding though, is the chia. 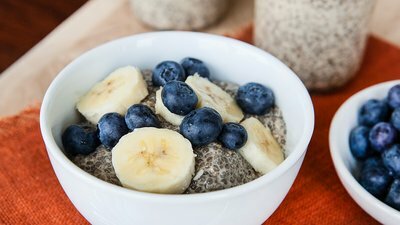 Chia seeds are one of the world's most nutritious foods, calorie for calorie. In just 2 tablespoons of seeds, you'll get 11 grams of fiber, 4 grams of protein, and 5 grams of omega-3 fatty acids. Chia seeds are also rich in calcium, which many women don't get enough of. You can make this recipe in individual jars for an easy, grab-and-go breakfast, or make a family-style bowl. Either way, it makes about 8 servings. This recipe will remain fresh in your refrigerator for about three days. If you don't think you can eat it all, divide the recipe by half so nothing goes to waste.